The Dutch telecommunications market is probably one of the most open in the world. Three years after its full liberalisation (which was completed six months ahead of the EU timetable) the Netherlands have approximately 65 operators with interconnection or special network agreements, including five providers of mobile telephony networks. Nearly all of the world's largest international players have established a presence in the Dutch telecom market. It is for their benefit and for the benefit of their advisers that this book has been published. Dutch Telecommunications Law contains the full text of the Dutch Telecommunications Act and of the most important decrees adopted thereunder, concurrently in Dutch and in the English language. 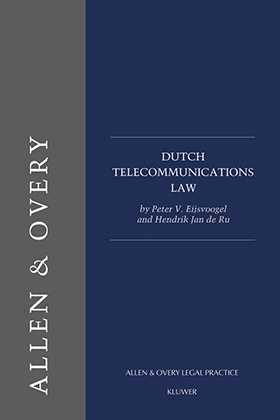 In addition, it contains a practical introduction to the telecommunications laws of the Netherlands described by leading practitioners in the field.